Anyone who has been on a Motion Master Ride know how much more immersive and fun it can be to watch a short movie clip in a chair that moves according to what is happening on the screen. D-Box has a new Quest Chair that replicates the Motion Master feeling, ushering a new era of entertainment in the living room. It is capable of achieving a more immersive movie-watching experience by incorporating a suspension system that lifts and moves in sync with the movie. That basic system is equipped with a controller and a set of factory-installed actuators. 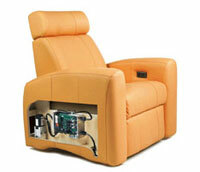 The Quest Chair can be used in a wide variety of options, including single chairs, sofas, and even loveseats. The Quest Chair uses a pair of direct-drive SynDrive motorized Actuators that are incorporated into the rear of the arms, while the front center pivot point delivers exciting motion effects. It is similarly priced to other special home theatre seats but comes with the added functionality of a more immersive viewing experience. With all the moving around, you can expect the Quest Chair to last through countless rough rides. The double-wall arm is fabricated from 13-ply European hardwood ply and incorporated with hardwood solids that act as reinforcing cross-members. Each seating component is fixed in its place via precision machinery, while certain parts of the Quest Chair are assembled by hand to provide you hours upon hours of comfortable viewing experiences. After all the riding and moving around, the Quest Chair is able to provide you with a soothing massage as well as keep you warm with its heating features. Each of these Quest Chairs feature either lush NuSuede of 100% Premium Leather if you have something against our bovine friends. Pick one up today and be the envy of the neighbourhood for $7,000.